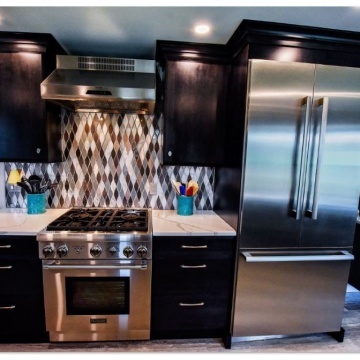 Interstate Custom Kitchen & Bath, Inc. 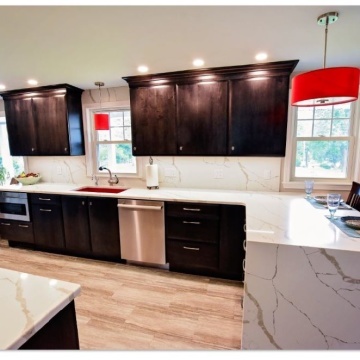 The purpose of Interstate Custom Kitchen and Bath, Inc. is to provide quality custom kitchen and bath installations to customers while meeting customer's specific needs while ensuring professional and individualized craftsmanship. I am most satisfied with the quality of their products. We're very happy with the bathroom results. The contractors showed up when they were supposed to and they did the work in a timely manner. Their work was excellent. I thought the whole process from beginning to end was very satisfactory. They were very responsive, very thorough. And the quality of the work was very good. They met my expectations throughout the work. They exceeded expectations in the cleanliness of the work site. Actually someone saw the work done and has already contacted them. I thought Joe and his team were very good listeners. They were very patient, they helped me make decisions. I never felt that I was being steered to do something that I wasn't comfortable with. 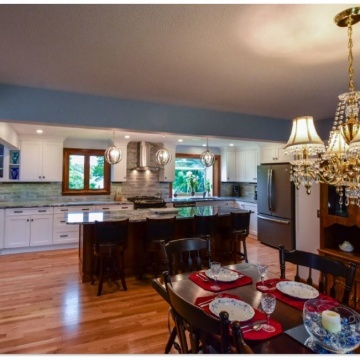 I have told everyone who knew about our remodel that they are the best around. We don't have any plans at present but wouldn't hesitate to use them in the future. EVERYONE was very professional, pleasant and easy to have in our home . . . project manager, carpenter, electrician & plumber were exceptional . . . painters - except for completing end of job touch-up are included in the above. They do excellent quality work. There were things that we chose that were not in the original package, but that was fine with us. 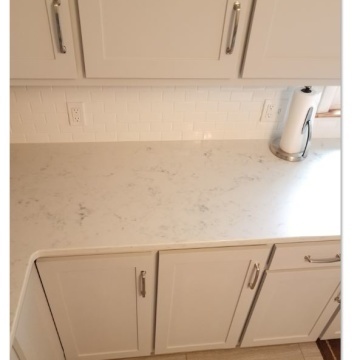 We chose quartz countertops instead of granite. 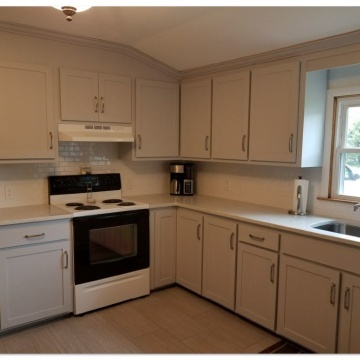 I was most satisfied because the cabinetry is beautiful and the contractors were pleasant and answered all of my questions. The kitchen came out looking spectacular. It was between two design centers, but we really liked Joe. He came out for the initial quote and measuring, and he was so easy to work with and pleasant. We are going to use them again. We are going to use them for our bathroom. They are exceptional. They have a lot of integrity and that is what made us comfortable with them coming into our home. I was most satisfied with the overall outcome, it was better than we thought it would be. The timeline was exactly as stated at the beginning of the project and the communication during that time was what we expected. We are 100% satisfied and have recommended Custom Kitchen to others. Timeline, communication, skills, and materials used. The kitchen project we worked on with Interstate came out fantastic. They were a pleasure to work, they with worked within our budget and timeframe. Everyone was professional and courteous. I highly recommend them to anyone who has a project to be done for home improvement. We worked through any issues, I can't think of anything in particular where they fell short. I was most satisfied with the manor in which the project was managed. Joe did an outstanding job managing the project, you can tell he has experience running projects. The fact that they wanted to fully scope out the project before starting it is never heard of. To hear a contractor use that term was very refreshing to me. I was pleased with the work and they were right on schedule as far as how many weeks it would take, they were very efficient. The carpenter that was working here was very excellent. Joe at Interstate Custom Kitchen and Bath was very professional and done an excellent job guiding us through our worry and stress, he took the stress out of it all. 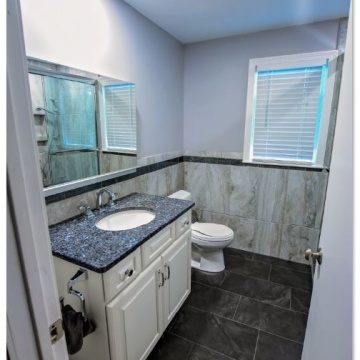 I was most satisfied with the way that Joe was able to take our ideas and give us the options that we needed to complete a beautiful bathroom. I heard about them from Kabula Home Improvements. 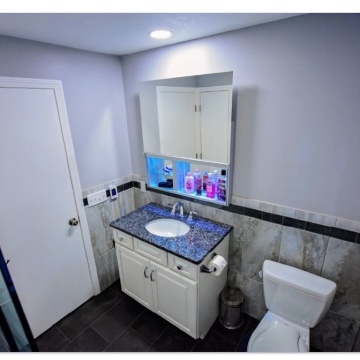 I want to thank Interstate Custom Kitchen and Bath very much for giving us a beautiful bathroom in a timely manner and keeping us within our budget, the staff was a pleasure to have in our home. 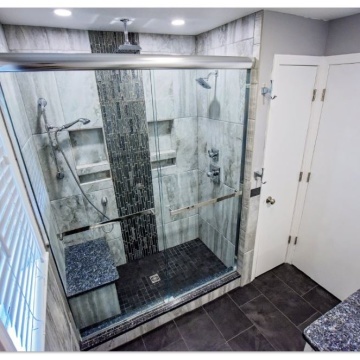 Our bath remodel with Interstate Kitchen and Baths was a great experience., from determining the final design to the picking out of materials and finishes. It was a selection process where the method of presenting options and making the correct selections kept us within out budget . 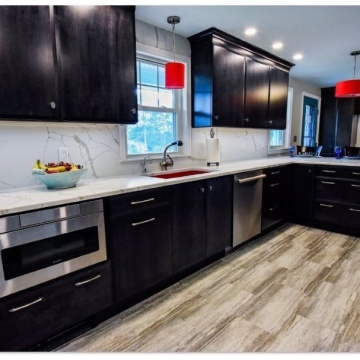 The subcontractors who performed the plumbing, electrical, dry wall, tile installation and painter were all professional and very personable, they did a great job and kept to the schedule to assure the project moved along towards completion. A big Thank You to Jim, who did allot of the work on site. 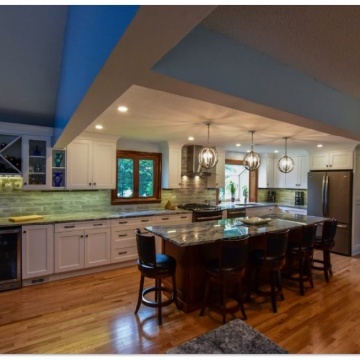 I would highly recommend Interstate Kitchen and Baths for your next kitchen-bath project. We see no areas that did not meet the needs of the process. 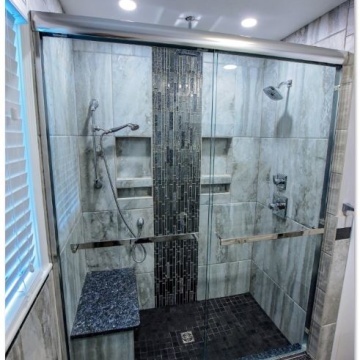 We would have to say the selecting of the items, tile, hardware, floor tile, shower tile, etc was the most daunting, there are quite a few things to consider even in a bathroom, but the process Interstate used makes that worry free and the results speak for it self! We heard about Interstate Kitchen and Baths from a friend who had bath work done. I would be happy to provide your information to anyone who would ask. We may have a need to update our upstairs bathroom (not the master bath)in the near future. Overall our kitchen remodel experience was good. Very few problems and unexpected issues. Joe was able to resolve everything that came up to our satisfaction. Interstate's contractors all worked quick and did a great job. Love our new kitchen. Their help picking all the colors and materials. We probably weren't the easiest couple to work with. Recommendations from people we know who had Interstate do their kitchen and/or bath. Helping me with picking out the materials. They were very helpful with the end product that I am very happy with. I did not know what it was going to be like before they came, but when I saw the job I was greatly satisfied. I love it. I have nothing but good to say about it. I am the most satisfied with the way they came out and described everything. They showed me samples of the work. I am satisfied with all of it. I really liked the job and the way it looks. I am really satisfied with it. Their responsiveness to every minor concern or problem that I had. I had a very minor problem about one year after the project's completion and it was taken care of within one day. I have dealt with other contractors before and I wouldn't trust them to come back out to my house and fix up a mistake that late in the game. I couldn't believe how easy it was to work with Joe and his team. 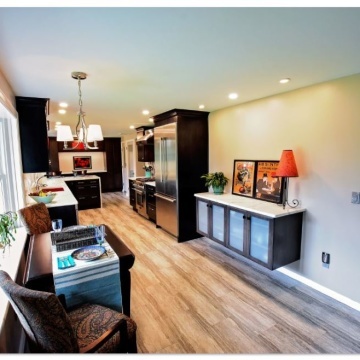 Interstate Custom Kitchen worked with us to make the vision of what our kitchen could be become a reality. We initiated several design changes and Joe was always willing to hear our thoughts and incorporate our ideas. They had a timeline of events right from the start and things were completed pretty much in line with that plan. We appreciated the 3 tier pricing model Joe used to estimate the total cost of the project right from the beginning. We felt everything was well planned and well executed by them. We would definitely recommend them to family and friends. Receptive to our ideas as well as good, timely communication. We are very pleased with the work that was done at our home. Joe and his team were professional, honest and considerate of our busy schedule. I have already referred a friend to them and she is as pleased as I am so far! I do tell folks that they are not a "bargain" priced company, but the quality of their work, the way they keep their word and their timliness is worth the extra price! The project had a few more snafus then we would have expected. Response time to address the issues noted above was great; Interstate took ownership of the problems and fixed them right away. I think they are really good and they have good communication skills. Great people and super follow-up...Lee & Sue C.
Just a great family-run business. I was most satisfied with the end product. It's a beautiful kitchen! I was most satisfied with the professionalism and the quality of the work. A friend of mine had their kitchen done by them.